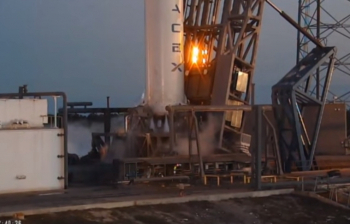 SpaceX has had a dramatic end to the week, with a successful Static Fire test of their Falcon 9 v1.1 rocket at Cape Canaveral, concluded just hours after the F-9R Dev-1 test rocket failed during testing in Texas. The test failure holds no impact to next week’s ASIASAT-6 mission, currently targeting Wednesday. SpaceX is preparing to follow up the ASIASAT-8 success with the lofting of the sister satellite, ASIASAT-6. A key processing milestone for the launch vehicle was the Static Fire test, a requirement that is used to ensure the pad’s fueling systems – and the rocket – function properly in a fully operational environment. The flow towards the ignition of the nine engines appears to have proceeded without issue, with a short burst of the nine engines confirmed at 7:41pm Eastern, slightly ahead of the the predicted opening of what was a four hour long test window. ASIASAT has confirmed the satellite is now encapsulated inside the Falcon 9 v1.1 fairing in the hanger. Next up is a data review, which will be fed into the Launch Readiness Review (LRR) – a key meeting that will confirm the launch date. The current projected launch date has held relatively firm on the schedule during this flow, only moving slightly to the right to what is now the August 27 target, within a launch window ranging from 00:50 to 04:05 Eastern. Sporting 28 high-powered C-band transponders, with a design life of 15 years. The successful Static Fire of the Falcon 9 v1.1 in Florida occurred just hours after the loss of the F-9R Dev-1 test vehicle in Texas. The successor to the Grasshopper test vehicle, the F-9R Dev-1 vehicle was employed to demonstrate a more aggressive set of objectives, feeding directly into the ongoing efforts that will hopefully result in Falcon 9 first stages returning back to terra firma. 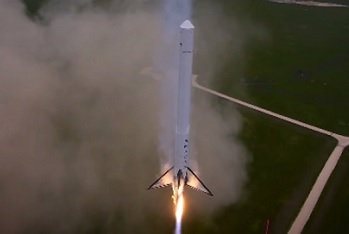 The F-9R Dev-1 resided with the Grasshopper at SpaceX’s McGregor Test Facility, and was a close match to the Falcon 9 v1.1 first stage dimensions. The first sightings of this test vehicle were shown via photos taken by several local people from a public road in the vicinity of the test site – some of which were provided to L2 (along with videos) – at the time providing the first glimpse of the landing leg structures. 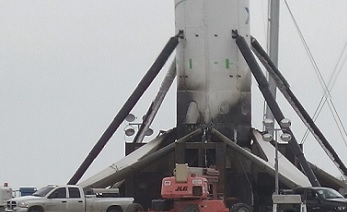 The legs were closely based on the hardware that SpaceX is now employing on their latest Falcon 9 missions – bar the two ASIASAT missions, due to performance requirements. The F9-R Dev-1 vehicle enjoyed several hops into the Texas air, providing impressive controllability, while refining the use of fins for stability and the pinpoint soft landing on her four legs. On Friday, the vehicle was lost. “Three engine F9R Dev1 vehicle auto-terminated during test flight. No injuries or near injuries. 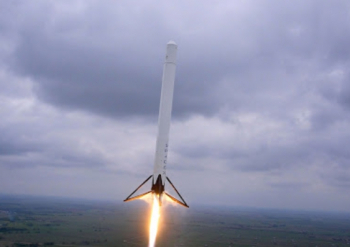 Rockets are tricky…,” noted SpaceX CEO Elon Musk on Twitter. The loss should not come as a major surprise, given SpaceX had already admitted they intended to push their test vehicles to the limits. On Friday, that became a reality, as amateur footage acquired by CBS showed the F-9R Dev-1 rising under the power of her three engines, before appearing to suffer from a loss of control, prior to the Flight Termination System (FTS) carrying out a controlled explosion, as it is designed to do. 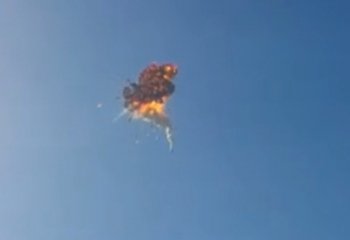 “During the flight, an anomaly was detected in the vehicle and the flight termination system automatically terminated the mission,” noted SpaceX in a statement. “With research and development projects, detecting vehicle anomalies during the testing is the purpose of the program. Today’s test was particularly complex, pushing the limits of the vehicle further than any previous test. Sources have confirmed the reason for the failure was specific to the test vehicle only. No impacts to flight vehicles are expected. Notably, limitations at the Texas site result in an AGL (Altitude above Ground Level) ceiling that is somewhat restrictive. As a result, another test vehicle – the Falcon 9-R Dev -2 – will take up residency at Spaceport America in New Mexico, where the vehicle will be able to fly at much higher altitudes. According to L2 sources, the Dev-2 has not yet been seen in residence at Spaceport America, although SpaceX workers were observed on site and working in an area that is expected to be utilized by the test rocket.